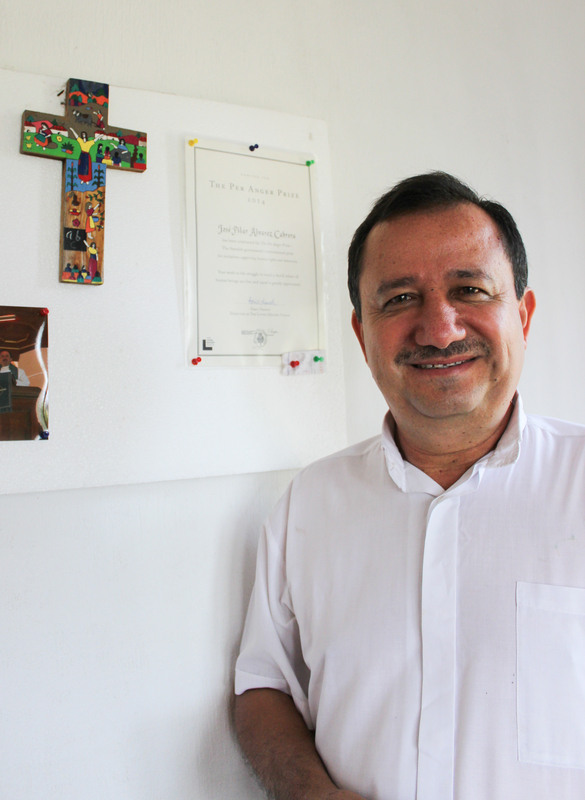 Despite threats to his life, priest José Pilar Álvarez Cabrera continues defending the rights of the indigenous Maya Chortí people in Guatemala. Now, he is awarded the Lobbyist for Change-award for 2017. The award will be presented in Stockholm on October 26th. – Unfortunately, José Pilar Álvarez Cabrera is one of many examples of how defenders of civil rights in Latin America are exposed to violence and threats, says Anneli Rogeman, jury chair and CEO for We Effect. José Pilar Álvarez Cabrera. Photo: Maria Lundberg. The award was founded by development cooperation We Effect and is awarded to a lobbyist or activist that has worked for the rights of people living in poverty. The winner is selected by a jury, which consists of among others former Prime Minister of Sweden, Ingvar Carlsson and former EU-minister Birgitta Ohlsson. – We hope that this award will strengthen José Pilar Álvarez Cabrera in his struggle for the rights of indigenous people, says Anneli Rogeman. José Pilar Álvarez Cabrera is a Lutheran priest. He has worked for human rights within the areas of Zacapa and Chiquimula since 2003. The Maya Chortí live on and in the vicinity to the mountain Las Grandillas. They are dependent on the eco system of the mountain to survive. Large corporations exploit the forests of the area, destroying the water resources of the indigenous people. The award consists of USD 10 000 and goes to those organisations that support José Pilar Álvares Cabreras in his work. For almost 15 years, José Pilar Álvarez Cabrera has defended the most invisible citizens of our world, the indigenous people. He has done so, in a country where those who stand up for human rights are harassed, threatened and exposed to violence while those behind those crimes walk free. José Pilar Álvarez Cabrera defends the rights of indigenous people Maya Chortí to continue living in the areas surrounding their home around Las Granadillas in Guatemala, and for their continuous access to water, natural resources and biological diversity. The jury made an honorable mention of Tola Moeun, who has worked against starvation wages in the factories of H&M in Cambodia.